..... Click the link for more information. , class Magnoliopsida, order Magnoliales, family Myristicaceae. See G. Milton, Nathaniel's Nutmeg (1999). Common spice considered to be an aphrodisiac in many cultures. Source of myrisiticin, a mild central nervous system stimulant and euphoric. 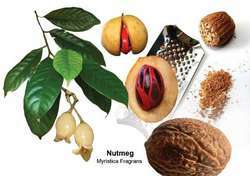 Some people grind down a nut for fresh nutmeg and take it as a way to get high. Be aware large doses are poisonous and can cause miscarriage. As an intoxicant, can lead to hallucinations, delirium and days of nausea and headaches. Used as an anti-parasitic. A small amount of nutmeg, about the size of a pea, can be taken once daily for a year to relieve chronic nervous problems, as well as heart problems stemming from poor circulation. Myristica fragrans. A dark-leafed evergreen tree of the family Myristicaceae cultivated for the golden-yellow fruits which resemble apricots; a delicately flavored spice is obtained from the kernels inside the seeds.